If you've completed the product evaluation checklist from the last chapter and believe your product and niche idea has potential, it's time to look at the potential market demand. Note: While completing this chapter and evaluating your potential market demand you must keep in mind that if your product and niche idea is a new product or a new use of an old product, there may be no visible market demand. That's not to say that market demand doesn't exist or that market demand can't be built, however, the methods outlined below can only give you an idea of market demand based on people actively searching for your product already. If your product is a new concept, this chapter may not be applicable to you. 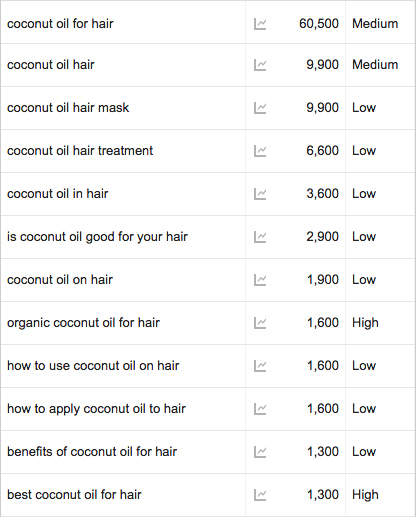 To begin understanding market demand, we're going to look at and use a few tools starting with Google's Keyword Planner Tool and using our previous example and product choice of a coconut oil hair care product. The Google Keyword Planner Tool allows you to search for keywords to determine how many searches per month are being made for that term on Google, how much competition there is competing for it and related search terms. This is a great start point for understanding potential demand. 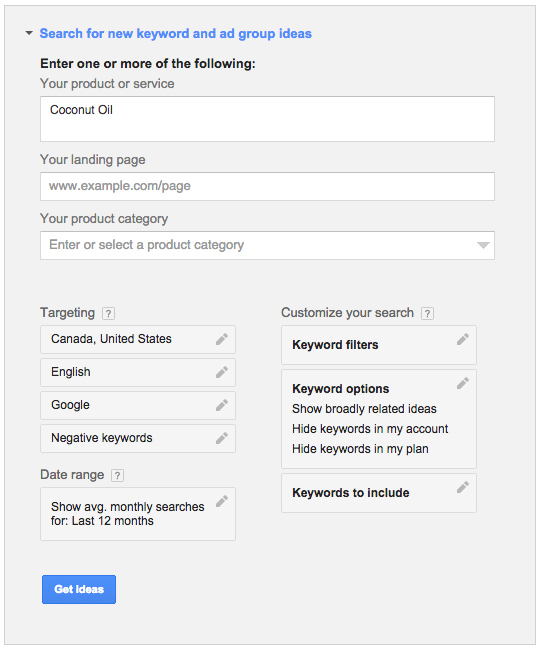 To use Google's Keyword Planner tool you need to have a Google Adwords account which you can get for free. Once you have an account, login and select Tools from the top menu, then select Keyword Planner. On the next screen, click Search for new keyword and ad group ideas. On the next screen enter your product idea (Note: You may want to try several keyword variations for best results). Double check your settings under Targeting to make sure they're to your liking. In particular, you want to make sure you are targeting the countries you plan to sell to. For our example, we entered "Coconut Oil for Hair" and selected United States and Canada as this would be the primary markets we would likely be targeting, thus we want to get our validation from those same markets. The first column will list the keyword you searched for as well as the various search queries related to the keyword you entered. The second column shows you the number of searches being performed each month in the geographic area you specified. 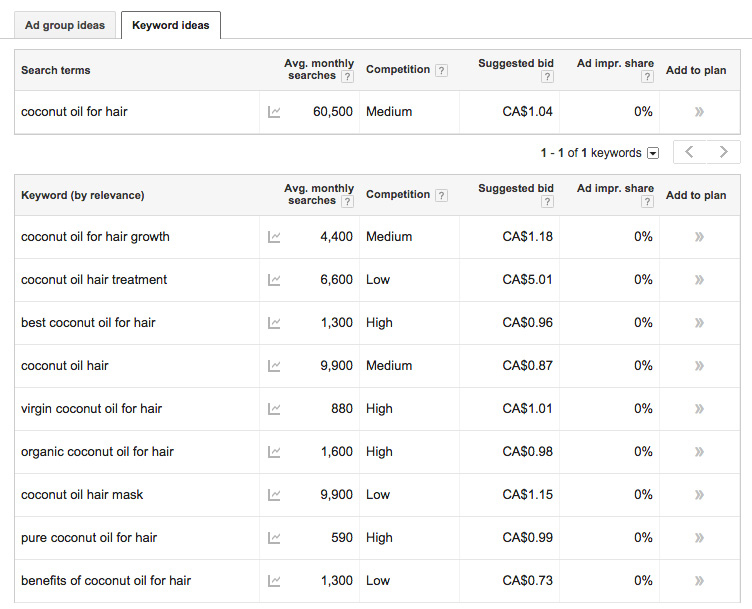 The third column is the level of (Google Adwords paid advertising) competition for each keyword. Long-Tail Keywords - Long-Tail keywords are keywords that are made up of 3 or more words. You're not just looking for long-tail keywords, but long-tails that are closely related to your product and niche. 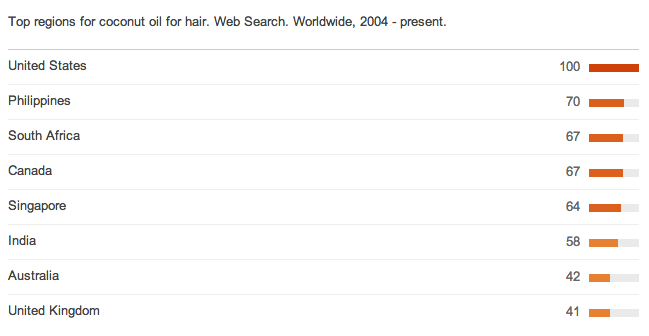 For example - coconut oil for hair care. High Search Volume - This can be subjective however you want to look at long-tail keywords that have a decent search volume each month. The higher the search volume obviously means the more people looking for your potential product. This can start to give you a good understanding of how in-demand your product is. There is no minimum number of relevant searches per month we would recommend but it's important to recognize the current potential. Based on our product idea, with a total of over 100,000 searches per month we would feel pretty strongly with this particular product choice, especially since many of the keywords are lower competition. The lower competition of the keywords generally means that it would be easier to rank for these keywords and cheaper to purchase ads based on these keywords. We know that people are searching for coconut oil information and products for their hair in the USA and Canada, but who exactly are these people are where in particular do they live? Sometimes products and trends can be very specific to geographic regions. For that reason, it's worth investigating where demand is coming from a little more. To do that, you should use Google Trends. Not only does Google Trends display the overall trend for your keyword it can also show you the top countries and cities that are searching for your particular keywords. From this, we can see that the Philippines and South Africa are also top countries searching for our potential product and we may want to consider marketing and shipping to if we move ahead. 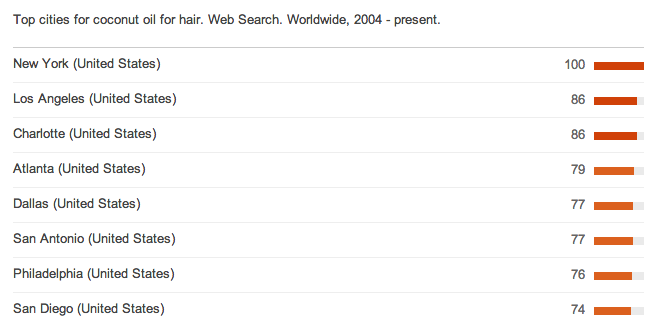 What cities in particular have the highest number of searches for "Coconut Oil Hair"
Much like the trending countries, the cities searching for our potential product give us insight into the distribution of interest and can give you insight into where you should focus your marketing efforts should you decide to move forward. Now that you've validated search interest from a search engine interest perspective, it's time to look at interest on social media. Twitter is an effective source for looking at market potential and product interest. You can use a service like Topsy to search for the total volume of tweets per day mentioning your particular keywords. 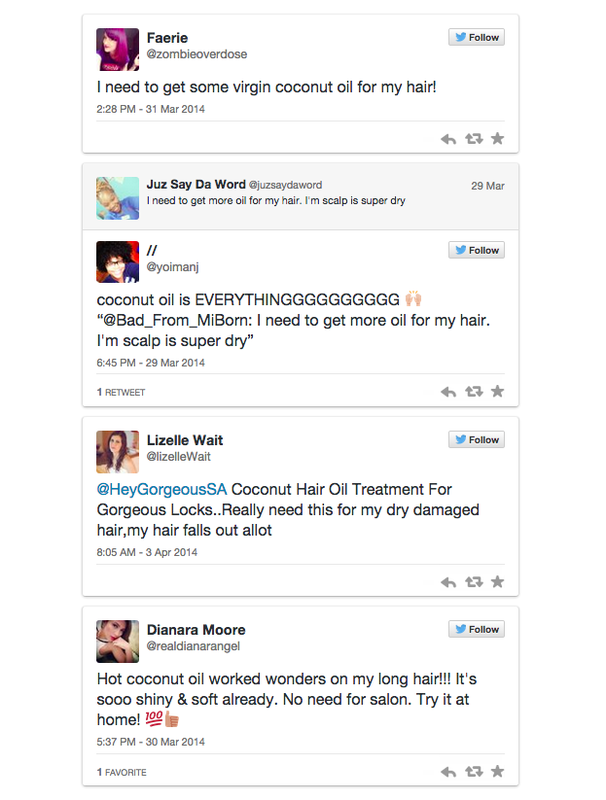 We used Topsy to search for the total volume of Tweets each day mentioning the words "coconut oil", and "hair" in a single tweet. In the previous chapter, you learned about all the evaluation points for evaluating a products potential, as well as understanding any potential pitfalls. In this chapter, you learned how to use Google's Keyword Planner to uncover search demand by searching for relevant keywords to your product idea. You also learned how to use Google Trends to better understand who is searching for your potential product along with the countries and cities they live in. Finally, you learned how to use Topsy to understand demand by how many public social conversations were happening each day around your product and niche idea. At this point, you should have a good idea of the current level of interest in your idea. In the next chapter, we're going to show you how to evaluate your potential competition so you know exactly if and how you can compete in your niche.